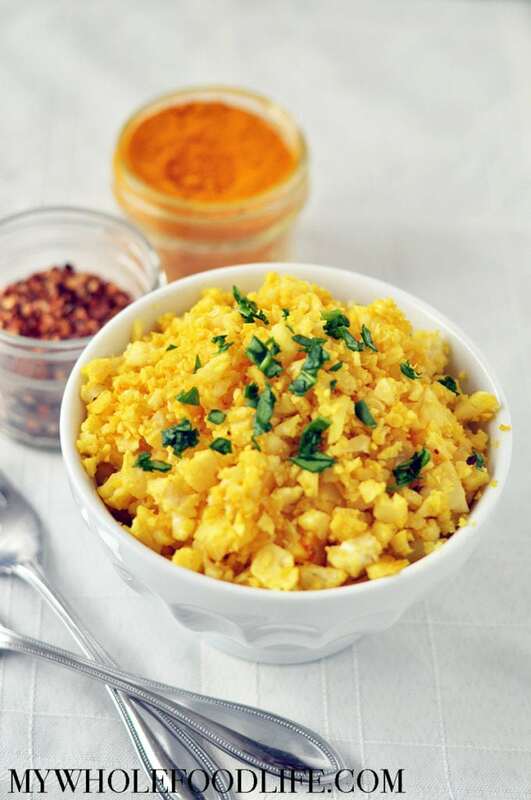 You have to try this Healthy Turmeric Cauliflower Rice! Have you heard about the benefits of turmeric? Turmeric is anti-inflammatory, can increase antioxidants, and lowers your risk for heart disease to name a few. Cauliflower rice can be a great alternative for those trying to eat a low-carb diet. It’s very low in calories as well. I don’t even really like cauliflower, but I do enjoy cauliflower rice. It’s super easy to make too. So is this healthy recipe. This recipe is vegan, gluten free and paleo approved. You can turn it into a main dish by adding some vegetables and your favorite protein. I think carrots and peppers would go really well with the flavors. For protein, I would suggest chickpeas or tofu if you eat soy. It’s very versatile! We filmed a short video for this recipe. You can view it below. This healthy turmeric cauliflower rice is a great low-carb alternative to traditional rice! Cut the cauliflower into florets. You can save the remaining stems for vegetable broth. In a food processor , add the florets and pulse until they are a rice-like consistency. In a large saute pan , add the cauliflower with a teaspoon of oil. I used avocado oil. Saute until they look toasted. Then add the garlic, sea salt and turmeric and still until combined. Sprinkle with red pepper flakes. If you want, you can squeeze the juice from 1/2 a lime in as well. This should keep at least 3-4 days in the fridge. I am not sure if it freezes well, though. I haven't tried. Enjoy! I love this recipie keep sending more of these. Thank you! Are you asking for more recipes with turmeric or more with cauliflower rice?